“The Mercy” is one of those movies where I found myself with more questions than answers by the end. These were not questions of a philosophical nature, but more along the lines of “Why did anyone feel that this was a story worth telling in the first place?” and “Why did so many enormously talented people sign on for such a fundamentally blah project?” It isn’t a bad movie as much as a dead one, never managing to click in the way all involved presumably hoped it would. 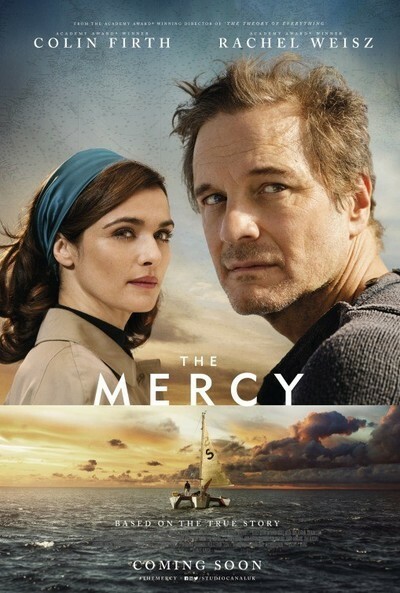 Based on a true story, “The Mercy” recounts the strange tale of Donald Crowhurst (Colin Firth), an entrepreneur and middling sailor who, despite having never really done any boating beyond day trips with wife Clare (Rachel Weisz) and their children, decided in 1968 to enter the Golden Globe Race, a competition sponsored by London’s Sunday Times to be the first person to circumnavigate the planet on a boat alone, without ever going ashore. This is the kind of journey that even the most experienced of sailors might have found too perilous to attempt, but the crazily optimistic Donald not only decides to enter but plans to make the journey in a 35-foot boat built from his own design. It sounds improbable but he manages to acquire sponsors and a press agent (David Thewlis) to promote his endeavor to the public and even has the support of his family, though it is clear that Clare is a tad unsure. Even before Donald sets sail, it seems as if his attempt is doomed to failure—the building of his boat goes wildly over schedule and budget and when the drop-dead date for his launch arrives, some observers doubt that the half-finished craft will even make it out to the open sea. The boat is not ready, but an onerous deal with his main sponsor means that he could lose his home and business if he does not complete the race. His journey has barely begun when he realizes that he is in way over his head and while he tries to pain a sunny picture during his contacts with his family and press agent, the combination of the ever-present danger surrounding him, the threat of financial ruin if he packs it all in early and the maddening loneliness he feels out there begins to send him over the edge as he begins to concoct an insane plan to get out of his predicament by faking his accomplishments. “The Mercy” recounts these events in a straightforward enough manner, the film cross-cutting between Donald’s increasingly desperate attempts to navigate the situation he has put himself in and Clare trying to hold things together on the home front. The problem is that it has no idea of what it was that drove Donald Crowhurst to do the things that he does here. Oh sure, it explains the potential financial ruin that he faces if he abandons his journey but it never delves deeper to try to get into the mindset of a seemingly rational person who would nevertheless get himself embroiled in such a crazy situation. Neither director James Marsh, who made the great documentary “Man on Wire” and the not-so-great Stephen Hawking biopic “The Theory of Everything” nor screenwriter Scott Z. Burns demonstrate any real curiosity about Donald. Admittedly, certain developments in the story preclude any definitive recounting of what went on in Donald’s mind during the time he spent on that boat but it would seem that anyone attempting to convey the story should at least have some potent thoughts on the subject. For example, the amazing “The Lost City of Z” told a similar story of failed derring-do that lacked a concrete conclusion but it demonstrated an interest in what would drive people to push themselves to such extremes in a way that puts this film to shame. That lack of depth and nuance in the script makes it all the more surprising that it managed to lure such a high-powered cast. As Donald, Firth certainly appears to be ideal casting—like the man he was playing, he looks like the last person who should be out in the middle of the ocean on a potentially fatal voyage—but since the script doesn’t provide him with any idea of what made Donald tick, he ends up simply going through the motions. David Thewlis, on the other hand, so wildly overplays his blowhard press agent character that it feels more like he is setting a score with someone instead of acting. The biggest disappointment, however, is the turn by Weisz. Now I am firmly of the belief that there is no film out there that could not be improved by putting Weisz into it. Here, however, she is stuck with the least interesting role that she has had in years—aside from one brief explosion at the end, all she does is sit around and fret politely in the kind of part that for which she is wildly overqualified. The strange story of Crowhurst contains so many intriguing ingredients that it could lend itself to any number of potentially fascinating interpretations from filmmakers with firm and distinctive ideas of how to tackle it. The fatal flaw of “The Mercy” is that it has all the ingredients but no particular idea of how to interpret them in a compelling manner. The film has been made with plenty of sincerity and no small amount of effort, but with no idea of what it wants to say.